Please, sir, may I have some seismic petrophysics? Petrophysics is an indispensible but odd corner of subsurface geoscience. I find it a bit of a paradox. On the one hand, well logs fill a critical gap between core and seismic. On the other hand, most organizations I've worked in are short of petrophysicists, sometimes—no, usually—without even recognizing it. When a petrophysicist is involved in a project, they usually identify with the geologists, perhaps even calling themselves one. There’s a lot of concern for a good porosity curve, and the interpretation of the volume of clay and other mineralogical constituents. There’s also a lot of time for the reservoir engineer, who wants a reliable estimate of the reservoir pressure, temperature and water saturation (about 20–40% of the pore space is filled with water in an oil or gas field; it’s important to know how much). This is all good; these are important reservoir properties. Acoustic impedance is the simplest way to compute a model seismic trace. We can compare this model trace to the real seismic data, recorded from the surface, to make the all-important connection between rocks and wiggles. The acoustic impedance curve determines what this model trace looks like, but we also need to know where it goes in the vertical travel-time domain. The sonic log comes into play again: it gives the best first estimate of seismic travel time. Since each sample is a measure of the time taken for a sound wave to travel the unit distance, it can be integrated for the total travel time. Yeah, that’s mathematics. It works. In short, the logs are critical for doing any geophysics at all. But they always need attention. Before we can use these logs, they must be quality checked and often edited. There is often a need to splice data form various logging runs together. The uphole sections are usually bad (there may be measurements in cased intervals, for example). Both of the logs are sensitive to hole condition. So the logs are critical, and always need fine-tuning. But I have yet to work on a project where a clean, top-to-tail DT and RHOB log are seen as a priority. Usually, they are not even on the List Of Things To Do. Result: the geophysicist gets on with it, and edits the logs. Now there's a DT_EDIT curve in the project. Oh, that name's been taken. And DT_Final and DT_edit2. I wonder who made those? DT_Matt then... but will anyone know what that is? No, and no-one will care either, because the madness will never end. There is even the risk of a greater tragedy: no geophysical logs at all. A missing or incomplete sonic because the tool was never run, or it failed and was not repeated, or it was just forgotten. No shear-wave sonic when you really just need a shear-wave sonic. No checkshots anywhere in the entire field, or the unedited data have been loaded in some horrible way. No VSPs anywhere, or no-one knows where the data are. Probably rotting on a 9-track tape somewhere in a salt cavern in Louisiana. A single, lightly edited, RHOB, DT, and DTS (if available) curve, from the top of the reliable data to the bottom. If they're available, a set of checkshots with time and depth measured from the seismic datum (they are almost never recorded this way so have to be corrected). Help understanding the controls on sonic and density with depth; for example, can we ascribe some portion of the trends to compaction, and some to diagenesis? Help understanding the relationship between lithology and acoustic impedance. Filter the data to see how the impedance of sands and shales vary with depth. If there are several wells with complete sets of logs and there's to be an attempt to model missing or incomplete logs, then the petrophysicist should be involved. What have I missed? Is there more? Or maybe you think this is too much? 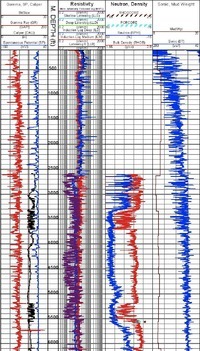 Last thing: when the petrophysicist is making his beautiful composite displays of the well data, ask him to include acoustic impedance, the reflection coefficients, the synthetic seismogram, and even the seismic traces from the well location. This will surprise people. In a good way.